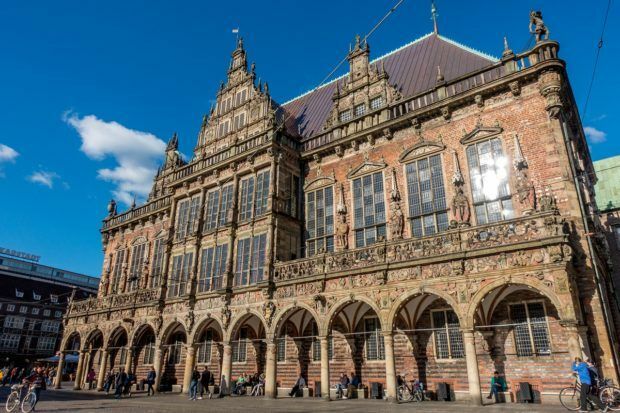 In the center of Bremen’s Old Town stands the most perfect building in Germany. At least as far as we’re concerned. This brilliant structure dates all the way back to 1405, so it’s full of history and the secrets of countless mayors and leaders. It’s the home of a fabulous, subterranean restaurant that’s been welcoming visitors and local wheeler-dealers for hundreds of years. And it holds thousands of bottles of German wine in the vaults of its 600-year-old cellar. 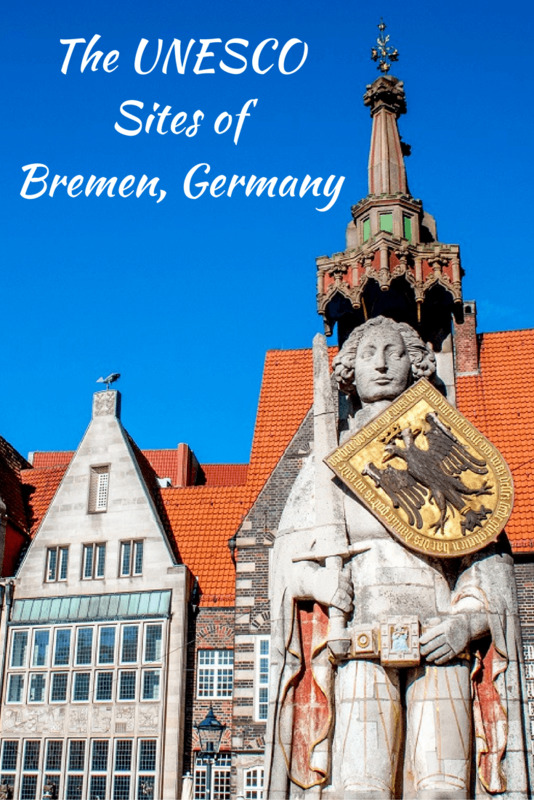 For our interests, the Bremen Town Hall is absolutely ideal. 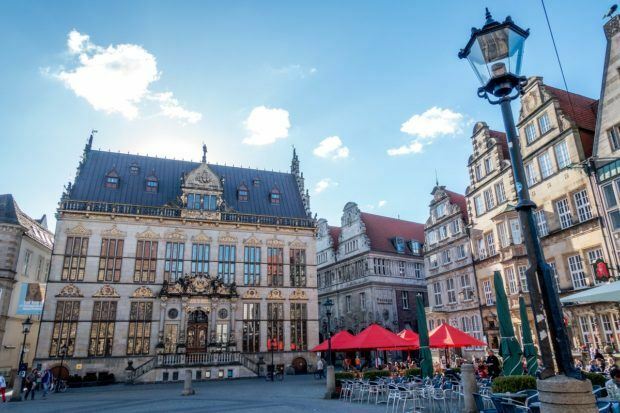 Although 60 percent of Bremen was destroyed during World War II, there are still many historic things to do and see in the city. Somehow, Bremen’s glorious Town Hall (Rathaus) made it through the War unscathed, along with a good section of the picturesque market square. Stepping into the plaza here, we felt like we were in the middle of a fairy tale. Perhaps that’s no coincidence considering how famous the city is for its namesake Bremen Town Musicians thanks to the Brothers Grimm. The gilded facades, distinctive merchant houses, and the Gothic and Renaissance details are something to behold. 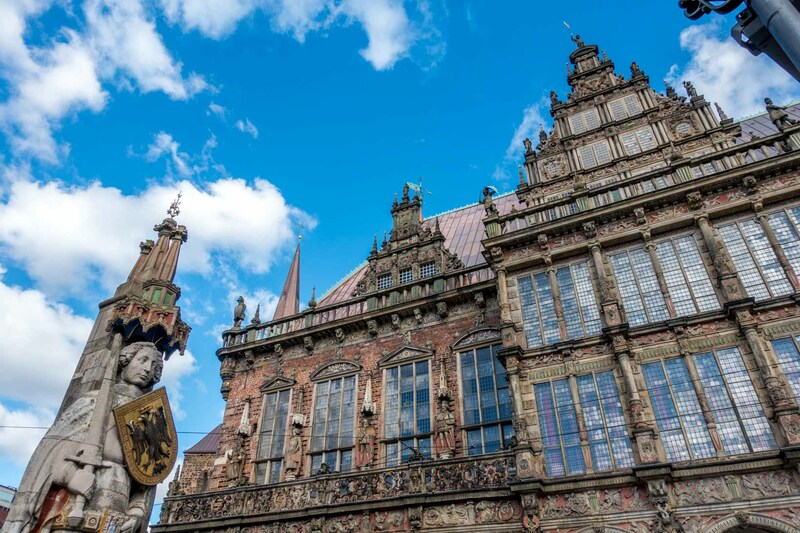 Once inside the Bremen Town Hall, the spectacular effect continued as we visited first the festival hall and then the marble cabinet dedicated to Wilhelm II, the last German Emperor. The rooms are decorated with paintings, coats of arms, and wood carvings, and the festival hall boasts a massive bronze chandelier. It was important, after all, that the hall be both grand and functional – it was home to Bremen’s Parliament until 1966. Nearby in the Upper Hall is where things get really impressive. A mixture of carved, dark wood and stained glass, the hall feels regal in its age. Models of Hanseatic League ships hang from the ceiling, a nod to the city’s tremendous seafaring merchant past. The mayors’ crests are emblazoned in bright reds and blues in the window panes. Large paintings surrounded with calligraphy show important stories of the time, including one in which the emperor Charlemagne gives Bremen its first church. 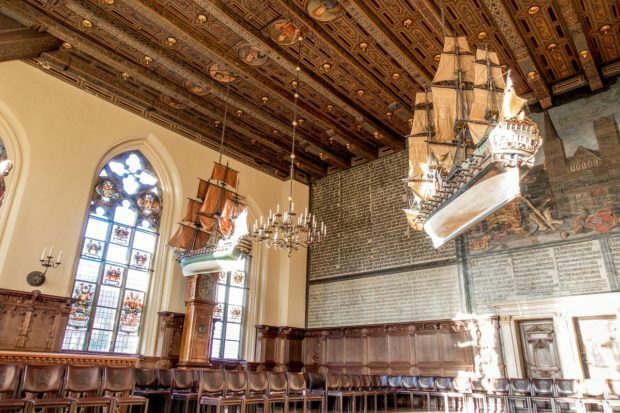 Set into the side of the hall behind a carved wall is the Golden Chamber, a room where Bremen’s mayor has welcomed distinguished guests for over 400 years. No expense was spared in the gilding of the room – each chair is insured for €20,000. We could only peer into the majesty across a velvet rope, but it was quite a view. 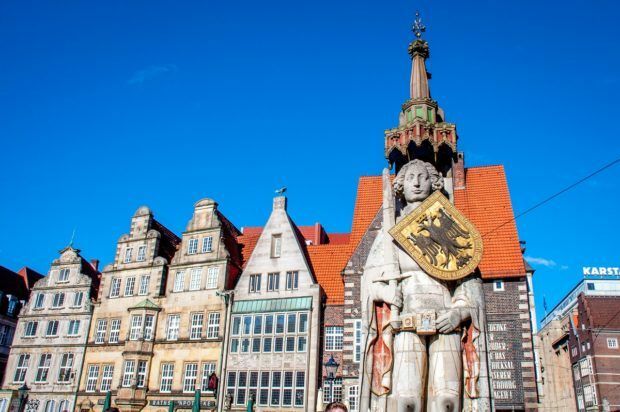 Just outside the Town Hall, a 33-foot-tall limestone statue – the Bremen Roland – stands, as if watching over the building and the adjacent market square and staring straight at the nearby cathedral. He was built in 1404, just before the Town Hall foundation was laid. An important figure in the time of Charlemagne, Roland is shown with his legendary sword and shield in what was the heart of the ancient city. The Bremen Roland is more than just a statue, though. He is a symbol of civic liberty and freedom in the face of the expanding power of the church. Together, the Town Hall and the Statue of Roland have been designated as UNESCO World Heritage Sites for their significance. The history and design of the Bremen Town Hall are unparalleled, but it’s the area below ground that makes this site even more remarkable. For centuries, merchants and leaders started their discussions in the elaborate rooms upstairs. But all that talking takes energy, and, sooner or later, they got a little hungry. Hence, the Bremer Ratskeller, a 700-seat restaurant just below the Town Hall. The Ratskeller was not devised as a clever way to feed tourists wandering around the Old Town or a marketing trick for the UNESCO sites. The space is, in fact, just as old as the Town Hall itself. The restaurant here served visiting merchants, lawmakers, and locals before the doors were even officially opened upstairs. And sometimes negotiations got a bit heated in the private booths. Ultimately, the Ratskeller had to make a rule that the doors to the booths could only be closed if more than two people were present – it prevented people from being forced into contracts they didn’t want and curbed the threats of violence. Conversations at the Ratskeller aren’t so contentious these days. We sat in one of the booths without worrying about any business deals. Instead, our biggest decision was which local specialty to try. The food in northern Germany is very different from what we had eaten on previous trips to the southeastern region of Bavaria. Near the North Sea, there is predictably more seafood and a bit less sausage. 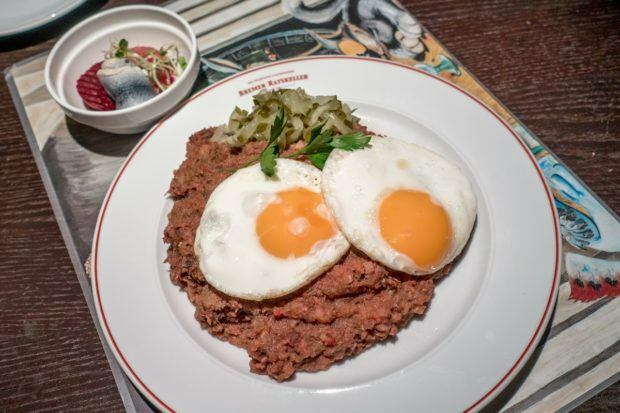 We ultimately opted to try the labskaus, a specialty of pureed corned beef, potatoes, onions, and beets, topped with gherkin and fried eggs and served with herring on the side. The flavor and color were uniquely purpleish and pungent, but I think Lance discovered a new favorite while I played it safe with some great roast pork. On the other side of the restaurant’s doors is perhaps our favorite part of the Town Hall – the wine cellar. This 600-year-old cellar holds thousands of bottles from across Germany’s 13 wine-producing regions. It is essentially a functioning, fabulous library of German wine. Until the 1980s, the wines were kept in huge wooden barrels, which are still on display downstairs, but bottles are now more practical. While almost every wine in Germany can be found in the wine cellar, some are truly special. Every year, wineries around the country fight for the chance to get the cellar master’s stamp of approval. He tastes about 3000 wines yearly, but only about 150 of the wines will get the special designation, which often includes a customized label. The best wines – both old and new – are kept in a locked area of the cellar. The oldest wine in the “treasure chest” dates from 1727, while the youngest is from 2015. These select bottles fetch sky-high prices when sold. A tour of the wine cellar isn’t just about looking at lots of special wines, though – you can also taste. For our tasting, we were ushered into a red-lit room dancing with candlelight and replete with the sweet, buttery smell of the best sherries and port wines. Along each side of the room was a half-dozen barrels named for the apostles. The Bremish have a flair for presentation. 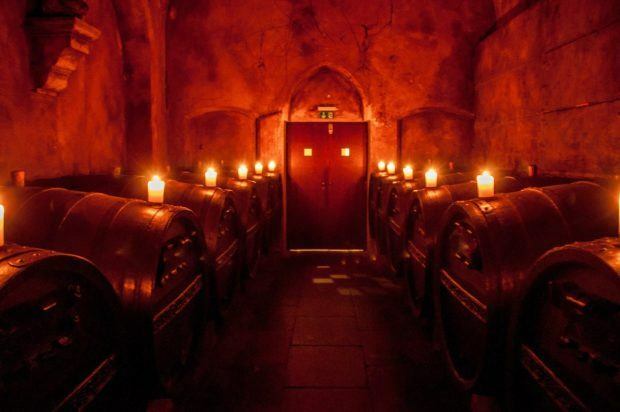 The final part of the cavernous space was an almost-pitch-black room with our tasting glasses, chocolate wine truffles, and a barrel filled with the oldest wine in the country. 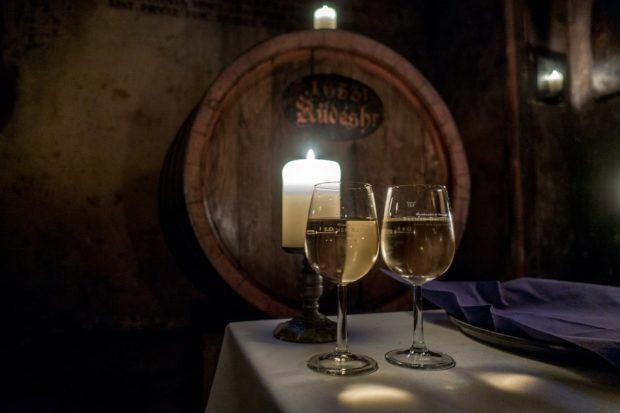 As we enjoyed our Riesling by candlelight, we learned about the dessert wine from 1653 continuing to age before our eyes. The wine itself is considered part of the UNESCO World Heritage Site, and, as such, is actually priceless. Only the most revered guests are offered a sip. The last person to try it was Queen Elizabeth, so it certainly wasn’t on the tasting menu for us. But in that perfect moment in our perfect building, we were quite content just to observe. We visited the UNESCO World Heritage Sites of Bremen thanks to the German National Tourist Board. All opinions of the breathtaking and delicious are our own. What do you think about The Perfect Place in Germany? That is one terrific building! Thanks for sharing. 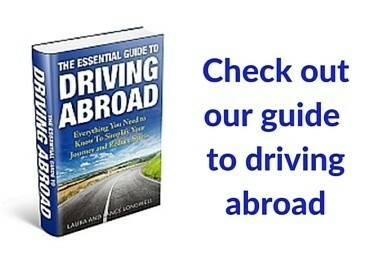 Incredible … will definitely check it out when I’m in Europe next year! 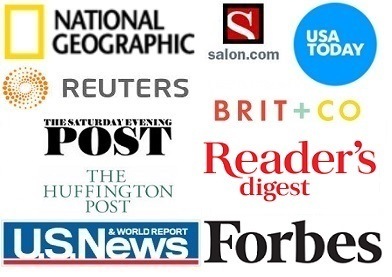 Thanks a lot for the great blog post. Our beloved Town Hall!